It will be interesting to say the least for this is the trend in motion – the militaristic police that have taken this to a whole new level. Even the tiny town of Keene, N.H., it was reported that Mayor Kendall Lane whispered to Councilman Mitch Greenwald during a December city council meeting that they were going to get their own tank,.The town is tiny with a population of just 23,000. They have had only two murders since 1999. 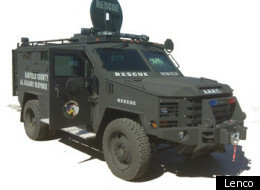 The U.S. Department of Homeland Security gave them a $285,933 grant to purchase a Bearcat manufactured by LENCO, an eight-ton armored personnel vehicle. It is clear. Homeland Security is arming against the people on a grand scale. The definition of “terrorist” is now anyone who disagrees with the government. The plain truth is they have seen the riots in Europe and Thailand watching how people rise up when the economy turns down. They know that is coming in this direction. What we saw in Ferguson is how the police are now trained and operate no different from a standing army. They are no longer “civil” in nature. Homeland Security has also militarized the nation and proof this is not a black or white issue as it was in the 1960s, is the simple fact that they are militarizing even small all white towns.